3D Kits No. Item No. 72-C001 Spitfire Mk. II. Two long-run injection moulded plastic sprues containing 9 parts each, Decals for 4 aircraft, 1 double sided A5 sized instruction sheet plus a 4 sided A5 sized paint/decal instruction sheet all in a zip-lock bag. Plastic sprues are as fine and well moulded as the kits they are aimed at with superior detail and accuracy and very small gates. Decals by Fantasy Paintshop look to be top notch with no problems and alternative light and dark greys for codes. This is an idea I thought the manufacturers themselves should have come up with years ago instead of producing new kits of different marks. This is a first product from a new company named 3D Kits. 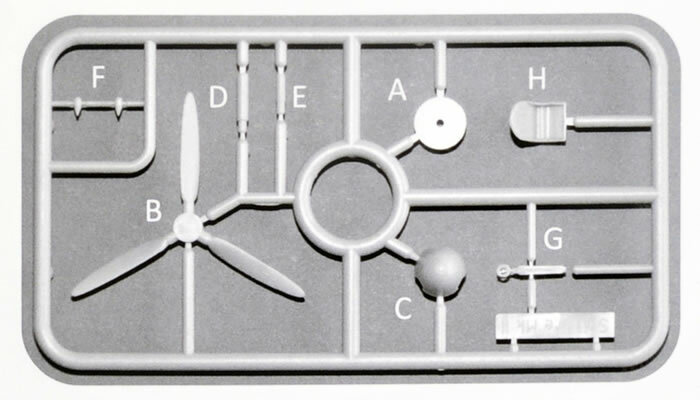 This set is aimed at four seperate plastic kits, the early Airfix Mk. I, the new Airfix Mk. 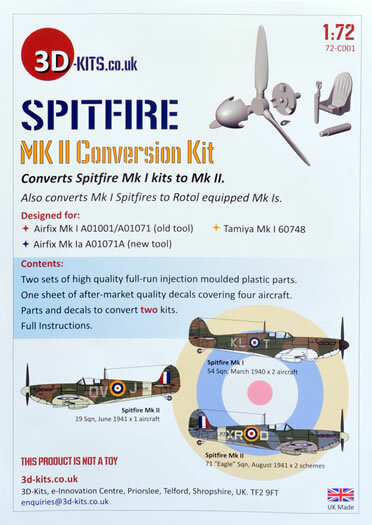 Ia, the Tamiya Spitfire Mk. I and the Tamiya Spitfire Mk. Vb to convert them all to a Mk. II (all Mk. IIs came with the Rotol prop) or a Rotol equipped Mk. I. There are two complete sprues with nine parts each and enough decals to convert two kits. 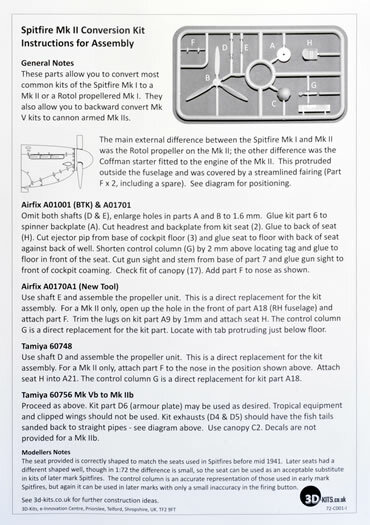 The nine parts include a Rotol prop, spinner and backing plate to match, two Mk. II coffman starter bulges ( a Mk. II recognition point), prop shafts for the new Airfix and Tamiya kits and more accurate seat and control columns. There is no noticeable flash, sink marks and only a few ejector pin marks in places that shouldn't be a problem. The connecting gates are very small and should be easy to deal with. The decals by Fantasy Paintshop look to be very good and in perfect register. 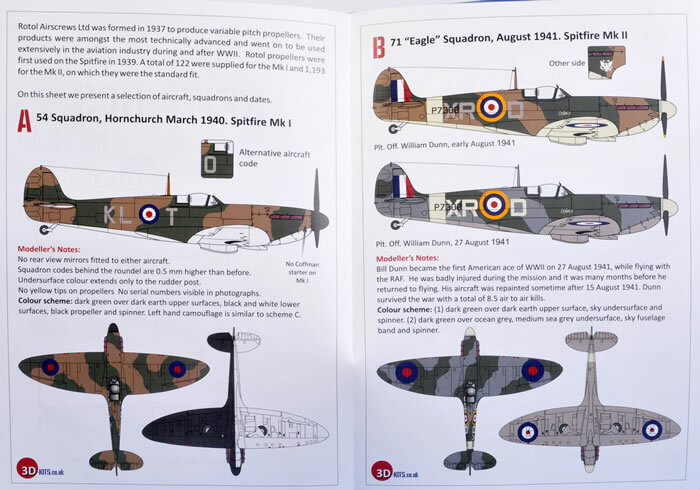 There are markings for four aircraft, two Mk. Is, KL-T and KL-O, both from 54 Sqdn RAF at Hornchurch in March, 1940. Both are in the colours of the day, Dark Green/Dark Earth over Black and White undersides. Both have black spinners and no serials. Spitfire Mk. II, P7308, XR-D “Ceylon II” of No. 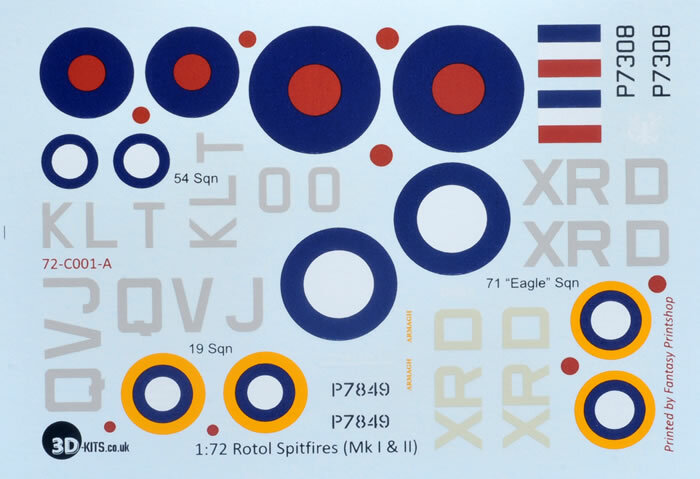 71 “Eagle” Squadron RAF, flown by Plt. Off. William Dunn, 1941. This Spitfire is in two different schemes, Dark Green/Dark Earth over Sky with Sky fuselage band and spinner and codes in Medium Sea Grey. The later scheme has the aircraft in Dark Green/Ocean Grey over Medium Sea Grey with Sky codes, fuselage band and spinner. Lastly, a Mk. II presentation aircraft from the Belfast Telegraph, 19 Squadron's P7849, QV-J “Armagh”in Dark Green/Dark Earth over Sky with Medium Sea Gray codes and Sky fuselage band and spinner. 3D kits deserves every possible encouragement as this is an excellent idea well executed and it will be interesting to see what they can come up with next.